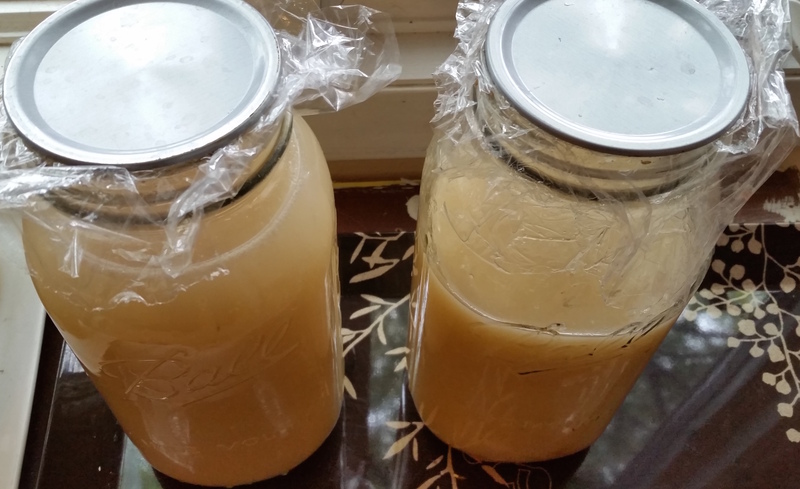 This post is a continuation of Pear Scrap Vinegar in Progress. 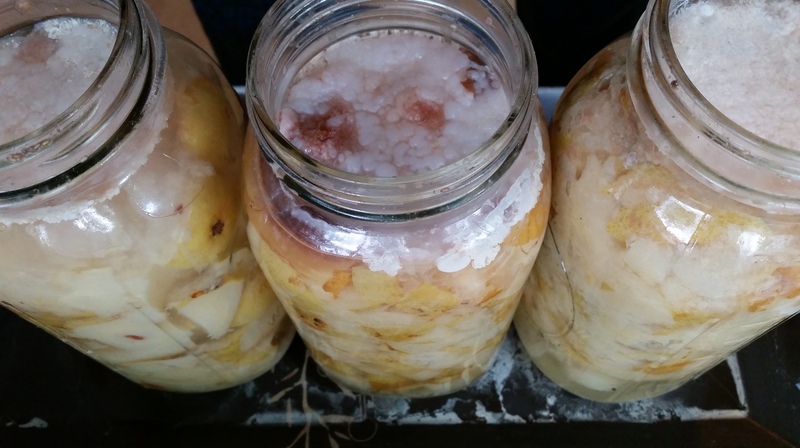 After sitting near the window for a couple weeks, my jars of pear scraps was making good progress toward vinegar. The liquid was bubbling and a layer of yeast and starches produced by vinegar bacteria was forming on the surface. It was time for the next step in the vinegar-making process! I put the pears in a mesh strainer and squeezed as much as I could. Lots of liquid came through, as did pear puree. From three half-gallon jars, I ended up with one and a generous half jars of slushy pear juice/puree mixture. I threw the strained solids (fibrous cores, seeds, skins and stems) in the compost. There’s no need to save the layer of yeasts and bacterial starches. The beneficial microbes permeate the slurry, even though you don’t see them with the naked eye. I returned the vinegar to the sill to continue to ferment. If you’re trying this at home, there’s no need to use a windowsill. It’s just a convenient spot for me. Many prefer to ferment their vinegars in a dark place with a consistent cool temperature, but in my house, that would be the basement, and I’d likely forget to check on them regularly. So I generally put my vinegars on the sill or the kitchen counter during the most active parts of the fermentation process. Over the next few weeks, the brew will continue to bubble, and then the solids will start settling. I’ll strain the vinegar again when the bubbling stops and the solids have compacted at the bottom of the jar. At that point, I’ll toss the solids.